The Kaluga Sturgeon is the largest fresh water fish in the world and can live up to 80 years. Kaluga Sturgeon is native to the Amur River basin (Russian Federation & Asia). It is a semi- anadromous fish, spending some of its life in salt water but most of its life in freshwater. Kaluga lives in all types of benthic habitats in large rivers and lakes of the Amur River basin. Diet: Juvenile Kaluga feeds on invertebrates during their first year and then switches to small fish. From three to four years of age the diet consists mainly of adult fish. This caviar is harvested from Kaluga Hybridized sturgeon also known as the River Beluga. Kaluga Hybridized sturgeon is farmed raised in the Qiandaohu Lake, in an environment close to its natural habitat, in fresh drinking water, free of pollutants. 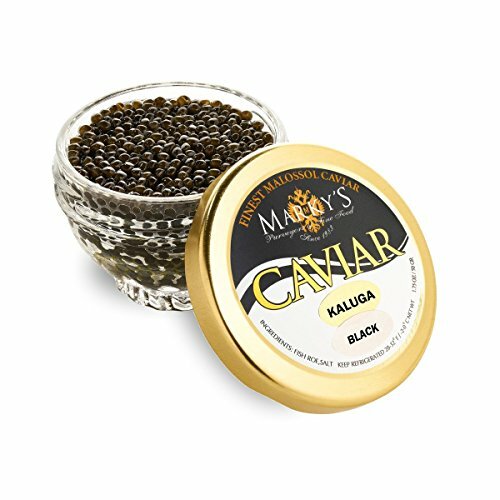 Kaluga caviar makes a great substitute for the lack of Beluga, due to its related genus and should be suggested to those who are interested in purchasing something similar. This caviar?s distinctive savory taste, with hints of fruit and nut, will add a note of exclusivity and sophistication to any table and therefore will make a wonderful addition to the menu of any high end restaurant or a bar! Attention: CITES certificate needed for export of this product. - Manufacturer: Marky's - Brand: Marky's Caviar - Origin: Asia - Size: Very firm, large individual beads - Color: Light gray to black - Flavor: creamy, buttery, nutty with that fabulous, famous burst of the sea. - Shipping: Product is perishable and will be shipped via Overnight shipping - Preparation: Fresh Frozen, Cured with Salt - Packaging: Jar / Tin - Storage Type: Only Refrigerated, the product is perishable! - Best served on a blini with cr?me fraiche or other accompaniments - Drinks: champagne brute or dry white wine - We guarantee you won't be disappointed with delicious, rich, sturdy flavor of our caviar! This remarkable, specially selected farm-raised hybrid caviar comes to us from Qiandaohu Lake,from an environment close to their natural habitat,from fresh drinking water,free of pollutants.Its firm,juicy grains ranging in color from light gray to black. And the flavor?It is exquisitely rich,very mild,buttery flavor with a unique, fully-flavored aftertaste that can satisfy the most demanding customer! Great substitute for Beluga Caviar,one of the highest quality caviar!